The Canadian Government sponsors this lottery for the promotion of the 2010 Soccer World cup to be hosted in South Africa. We happily announce to you the draw of the Euro Afro-American Sweepstake Lottery International Programs held on the Wed Nov 8th 2006 in Essex United Kingdom and Ontario Canada. 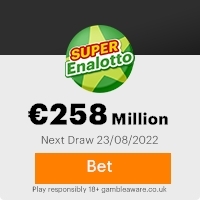 Your e-mail address attached to Ticket Number: B6464 31604523 111, with Serial Number 72363706 drew the winning numbers, 8th of NOV /3/4 /20/ 38/ 42 /48 /, bonus number 34 Draw for LOTTO 6/49 under the choice of the lottery in the 2nd category of daily three. You have therefore been approved to claim a total sum of US$820,000.00 (Eight Hundred and Twenty Thousand United States Dollars) in cash credited to file EAAL/9080118308/05. Please note that your lucky winning number falls within our Afro booklet representative office in Africa as indicated in your play coupon, because this particular draw was selected to promote the 2010 World Cup to be hosted in South Africa hence your winning information must be kept to enable you participate in our subsequent draws which will see 500 participants traveling on an all expense paid trip to South Africa for the Soccer World Cup 2010. In view of this, your US$820,000.00 (Eight Hundred and Twenty Thousand United States Dollars) would be released to you by an accredited commercial Bank in South Africa. Our African agent will immediately commence the process to facilitate the release of your funds as soon as you contact our African Agent's office Mr. Leon magnus. All participants were selected randomly from World Wide Website through computer draws system and extracted from over 10, 000, 00 companies and personal e-mails. For security reasons, you are advised to keep your winning information confidential till your claims is processed and your money remitted to you in whatever manner you deem fit to claim your prize. abuse of this program by unscrupulous elements. Please be warned! To file for your claim, please contact our agent Mr. Leon magnus at TEL: +27-766-914-001, EMAIL: canadapayagent@canada.com, so that he can process your winnings for quick and urgent release of your winning prize. To avoid unnecessary delays and complications, please quote your reference numbers in any correspondences with our designated agent. has ensured that you won this Competition. This Email with the Subject "WINNING NOTIFICATION Batch No. Lotto 6/49" was received in one of Scamdex's honeypot email accounts on Fri, 05 Jan 2007 02:12:27 -0800 and has been classified as a Generic Scam Email. The sender shows as "canada board" <canada2010board35@hotmail.com>, although that address was probably spoofed. We recommend that you do not attempt to contact any persons or organizations referenced in this email, as you may expose yourself to scammers and, at the very least, you will be added to their email address lists for spam purposes.